Few landscapes are as striking as that of the Hebrides, the hundreds of small islands that speckle the waters off Scotland’s northwest coast. The jagged, rocky cliffs and roiling waves serve as a reminder of the islands’ dramatic geological history, inspiring awe and dread in those drawn there. With Britain at their back and facing the Atlantic, the Hebrides were at the center of ancient shipping routes and have a remarkable cultural history as well, as a meeting place for countless cultures that interacted with a long, rich Gaelic tradition. After years of hearing about Scotland as a place deeply interwoven with the story of her family, Madeleine Bunting was driven to see for herself this place so symbolic and full of history. Most people travel in search of the unfamiliar, to leave behind the comfort of what’s known to explore some suitably far-flung corner of the globe. 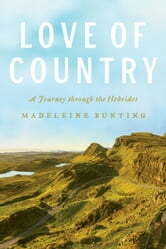 From the first pages, it’s clear that Madeleine Bunting’s Love of Country marks a different kind of journey—one where all paths lead to a closer understanding of home, but a home bigger than Bunting’s corner of Britain, the drizzly, busy streets of London with their scream of sirens and high-rise developments crowding the sky. 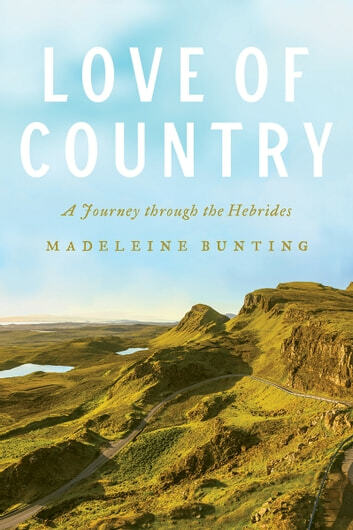 Over six years, Bunting returned again and again to the Hebrides, fascinated by the question of what it means to belong there, a question that on these islands has been fraught with tenacious resistance and sometimes tragedy. With great sensitivity, she takes readers through the Hebrides’ history of dispossession and displacement, a history that can be understand only in the context of Britain’s imperial past, and she shows how the Hebrides have been repeatedly used to define and imagine Britain. In recent years, the relationship between Britain and Scotland has been subject to its most testing scrutiny, and Bunting’s travels became a way to reflect on what might be lost and what new possibilities might lie ahead. For all who have wondered how it might feel to stand face-out at the edge of home*, Love of Country* is a revelatory journey through one of the world’s most remote, beautiful landscapes that encourages us to think of the many identities we wear as we walk our paths, and how it is possible to belong to many places while at the same time not wholly belonging to any.